As a preview to the 3rd annual Just for Laugh’s JFL42 stand-up comedy festival coming up this September, Ron Funches was one of the comics who gave us a “JFL42 in July” preview on July 22nd. We attended the first show at 8 pm at the Comedy Bar, which was opened by Torontonian, K. Trevor Wilson. Funches jokingly described himself as a “300 pound black man who giggles like an Asian schoolgirl”; he came off as very unique and appealing in his delivery. The audience was with Funches the whole time as he delivered jokes about using the n-word to shame pets, to picturing himself as a “pug riding a decorative pillow” . Throughout the show he made pop culture references harking back to the ’80s and ’90s that went over well with the crowd. Funches is currently a regular on NBC’s Undateable, and will be at JFL42 on September 24, 25, and 26. Catch him on the Tonight Show with Jimmy Fallon tonight (Thursday, July 31st)! JFL42 headliners include HBO Girls’ star Lena Dunham as well as Seth Meyers, Amy Schumer, Joe Rogan, Nick Offerman and Wanda Sykes. Passes to JFL42 are on-sale now. Charge-by-phone at 1-855-985-5000 or buy online at jfl42.com. Festival passes range from $49 – $299 (excluding service charges). 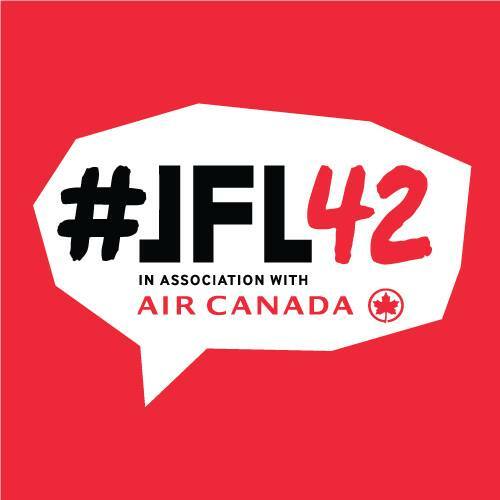 JFL42 takes place from Sept 18-27th at various venues including the Sony Centre for the Performing Arts, Yuk Yuks, ALTdotCOMedy Lounge, Comedy Bar, The Second City and more.